No kitchen sink should be without a pot scrubber for getting into the nooks and crannies of dirty pots and pans. 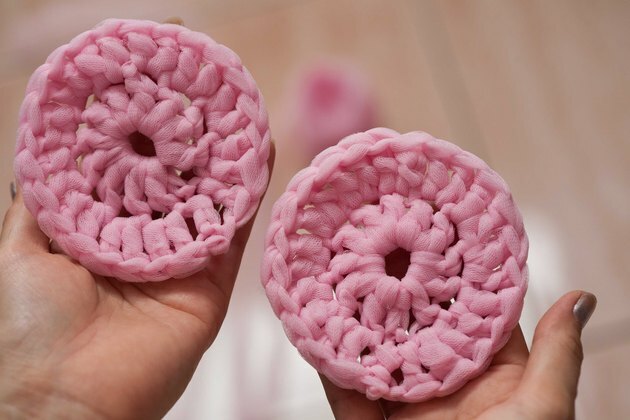 While you can purchase a basic pot scrubber, if you enjoy crocheting you can also crochet pot scrubbers for sudsing your dirty dishes. Use tulle in a color that fits your kitchen decor, and spend an afternoon or evening crocheting a pot scrubber to keep by the kitchen sink. Cut the tulle into 3-inch-wide strips and sew the ends of tulle together with a sewing machine so you have 24 3-inch-wide strips sewn together end-to-end. 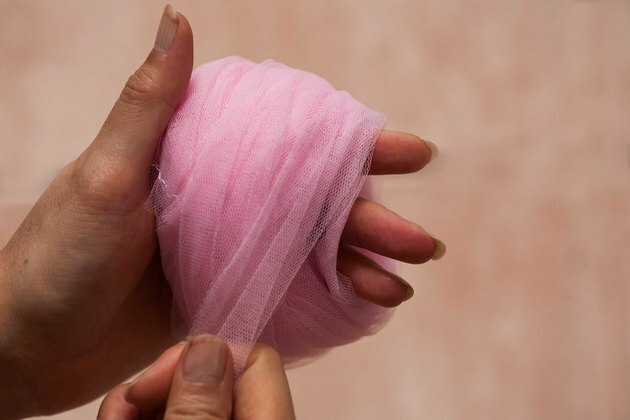 Wind the prepared tulle into a ball. Chain 5 loosely with the prepared tulle and crochet a slip stitch in the first chain to make a ring. Chain 3. Crochet 11 double-crochets in the ring and then join the last double-crochet stitch to the chain-3 with a slip stitch. Chain 3 and crochet a double-crochet stitch in the same stitch. Crochet two double-crochet stitches in each stitch around the circle. Join the last double-crochet stitch to the chain-3 with a slip stitch. Cut the tulle off to leave a 3-inch tail. Yarn over and draw the tail all the way through the loop. Remove the crochet hook and pull the loop tight. Thread the end of the tulle tail through the yarn needle and weave the end in to the crocheting. Make a second identical circle. Place the two circles on top of each other. Thread the yarn needle with a 12-inch length of matching cotton yarn. Insert the needle through the center of the two circles and make two 1-inch stitches in an "X" in the center of the circles. Tie a knot in the yarn, weave in the end and clip any excess yarn to finish the pot scrubber.